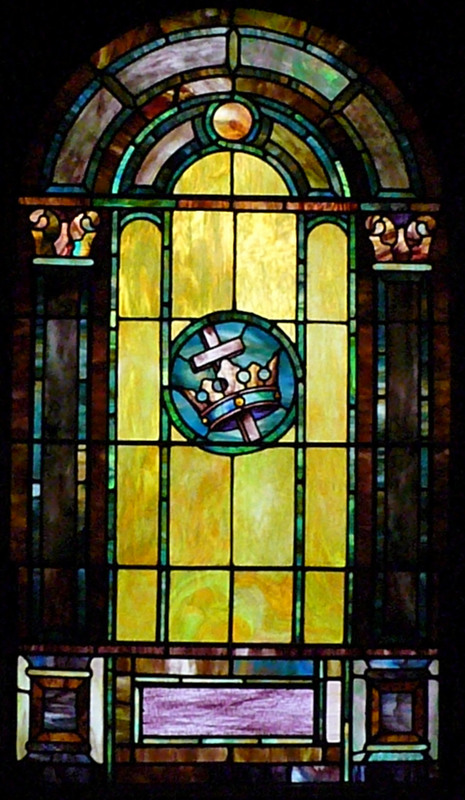 This window was dedicated on March 3, 1959. The Stained Glass Window has the Alpha and Omega centered on an Open Book- the Bible, God's Holy Word. Christ is also the Word of God which became flesh and revealed the full nature of God. In this stained glass window are the four living creatures which are seen in the book of the Revelation 4:7, 5:8, etc. These four living creatures are always found near the throne of God and near the Lamb of God. They have six wings full of eyes. They are constantly praising and worshiping God. They represent the noblest, the strongest, wisest and swiftest creatures in nature. The four living creatures are the Lion, (located on the left side of the window) which is the Supreme Beast. The four living creatures also represent the four Gospels. The Lion represents Mark. The Ox, (located on the right side of the window) which is the Supreme Cattle, represents the Gospel of Luke. The Man, (located at the top of the window) which is the Supreme Creature, represents the Gospel of Matthew. And the fourth creature is the Eagle, (located at the bottom of the Window) which is the Supreme Bird, represents the Gospel of John. Night and Day these four living creatures never rest from their doxology of praise to God for His Holiness, (they sing, in Revelation 4:8, "Holy, Holy, Holy"); His Omnipotence or Might, (call Him The Lord God Almighty); and His Everlastingness or Eternity, (Who was, and is, and is to come). Around the four living creatures in this window we see colors of Red, the symbolic color of fire, a color for the flames and tongues and Holy Spirit of God. On the outer edges of the window can be seen wheat sheaves of the Harvest representing the harvest of souls and used in communion as well as a symbol for life. Along with these symbols there is the overall circle of the window which represents eternity and flowers which look like either a Rose of Sharon (image of Christ) or Lilies which are signs and symbols of resurrection and new eternal life in Christ. All of these windows date back to and are typical of the 1885-1895 period, with glass hobnail bull's eyes, and poinsettias. The scriptural verses are written in Old English style block print. The windows are dedicated to early persons of Ocean Grove. The five-sided star with rays symbolizes Epiphany and the star followed by the Wise Men. The all seeing Eye of God is a symbol of the power, ever-present Spirit, and majesty of God. (Psalm 33:18) a source of this. The sickle and the wheat are symbols of the harvest. The harvest of souls in the book of the Revelation (14:15). The Torch is a symbol of the Truth, born by succeeding generations to pass on to the future. Also John 8:12, Jesus' identified as the light of the world. Two candles or torches bound together signify the human and divine nature of Jesus. In Memoriam Edward Wilson Jr. The Crown is a symbol of the Divine nature of Jesus Christ. A crown also can be used to denote our status as heirs of heaven. The Crown of Life is given to those who are faithful unto death (Rev. 2:10). The Anchor is a symbol of hope based on Christ's redeeming work. Another secret sign of the early church, the symbol derives from Hebrews 6:19. Note the symbol of the cross is a part of the anchor form and it relates to the ship as a type of the church. The Dove with the olive branch symbolizes peace, purity, modesty, humility, wisdom, and gentleness. The Descending Dove symbolizes the Holy Spirit as He is described in John 1:32 and is a symbol of peace. In Memoriam Elizabeth M. Ostrom. Window no. 8. The Lady in Pink, clinging to the Cross. No information has been found for the symbols of this window. In Memoriam Rev. J.S. Inskip 48 years a Minister on the M. E. Church. The Cross perhaps the fundamental symbol in Christianity representing the whole meaning of Christ's saving death and resurrection, life and ministry, incarnation and coming in glory. There are many forms of the cross, Christ triumphant as King of Kings and Lord of Lords is the cross with crown. The open Holy Bible symbolizes the living Word of God proclaimed in the midst of God's people. In Memoriam Rev. Charles Karsner M.D. A Faithful Minister of Christ. The nine 1900's windows on the west end of the sanctuary were reconstructed and placed six in the lower gallery and three in the upper. As part of a fund raising effort, the rest of this stained glass was made into crosses which now hang in many Ocean Grove homes. A comparison of the colors and style of these windows sets them apart from those of 1885-1895.